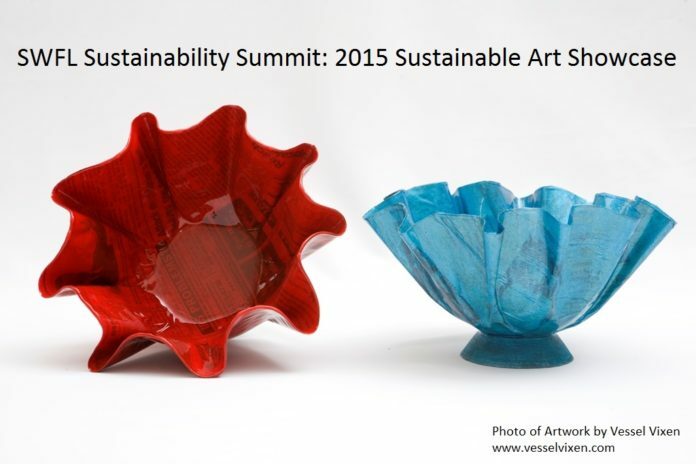 The 2015 Sustainable Art Showcase area is FREE and open to the public. The public does not need to purchase a ticket to the Sustainability Summit in order to visit the artist and purchase your art work. While you’re there, purchase a sandwich and soft drink from the Harborside concession service and peruse the gallery! If you’re getting off of work, visit the gallery before you head home. Show time has been increased to 8:00 a.m. – 6:00 p.m. The Best in Show 1st, 2nd and 3rd place winners will be presented during the reception, which starts at 4:30 p.m. In order to secure your space and ensure that your information is provided to the public and Summit attendees, you must submit your registration for the event now by downloading your application and submitting it along with payment. A standard size table and two chairs are provided for $25 with your registration*. If you need electrical power, there is an additional cost of $35.00 and must be requested with your registration. *Does not include food or beverages. Photo of artwork by Vessel Vixen, partner in organizing the sustainable art show. Next articleTop 10 Reasons to Buy Your Tickets Today!